Last week I mentioned that on Saturday, May 20, the Art Deco Society of Los Angeles will host the 15th annual Avalon Ball in the Catalina Casino Ballroom. But that’s not the only big event going on that week-end. If you can’t get to the island, get yourself to Culver City for the Jolson Festival, sponsored by the International Al Jolson Society. Complete information is on the Society’s website at www.jolson.org. And in honor of the Jolson Festival, the third segment of this week’s show is devoted to Al Jolson. We’re also going to spend some time in the kitchen, do some weeping, and celebrate Douglas Furber’s birthday and Mother’s Day. 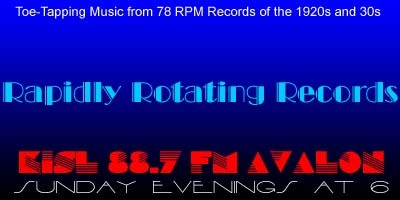 Several records on this week’s show are making their RRR debut, so let us know which is your favorite. Why Should I Weep About One Sweetie – Brooke Johns Orchestra / Brooke Johns, v.
Weep No More, My Baby – Ray Noble AHO / Al Bowlly, v.
The Old Kitchen Kettle (Keeps Singing A Song) – Ted Weems Orchestra / Parker Gibbs & Trio, v.
You Ain’t Heard Nothing Yet – Charles Prince Orchestra / Al Jolson, v.
Three Wishes – Ray Noble AHO / Al Bowlly, v.
That’s Where The South Begins – Orpheus Dance Band / Maurice Elwin, v.
Let Me Give My Happiness To You – Ted Weems AHO / Elmo Tanner, v.
Your Mother And Mine – The Dorsey Brothers’ Orchestra / Unidentified, v.
Baby Your Mother – Sam Lanin’s Dance Orchestra / Allan Reid (Leroy Montesanto), v.